Are you looking for the best sewing machine as a beginner or an expert? 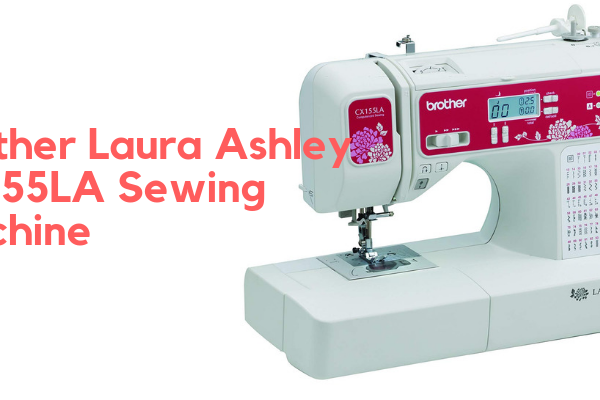 The Brother Laura Ashley CX155LA is the one for you! We can agree that sewing machines are not an easy investment and should be given a lot of thought before making final decisions. For this reason, this is exactly what this article will do for you. 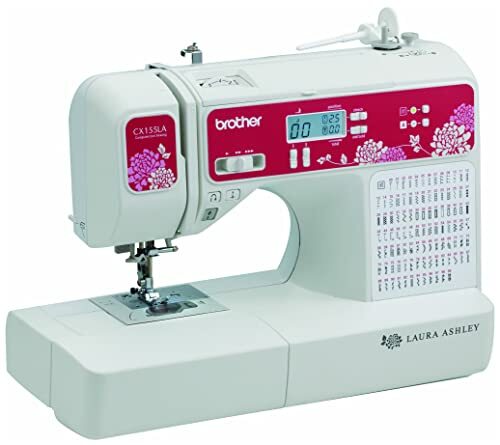 We will review the Brother Laura Ashely sewing and quilting machine for you. Brother is a renowned manufacturer in the market. Some incredibly reliable and products packed with features are available by Brother. So what is so great about this particular model by Brother? The Brother Laura Ashley CX155LA is a limited edition. The machine stands out with its colorful display. 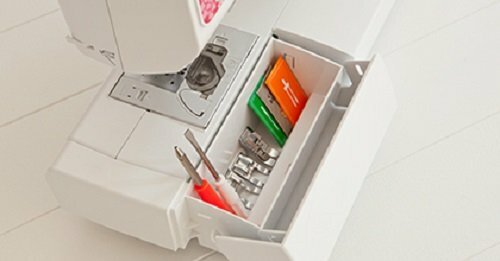 The machine is great for both sewing quilting with its range of basic to extra features and accessories. It also qualifies as a computerized sewing machine which means it will sew faster and more efficiently. Thus, it is a suitable option for both beginners and experts. The most distinctive feature of this sewing machine is its attractive, colorful appearance. The machine has a bright pink colored floral design printed on the front body. Add color and style to your sewing collection. This makes it suitable especially for those who have a sewing desk or station to decorate. The machine has a stitch chart in the front. The chart is there for your ease and convenience. Simply glance over the chart to recall which stitch you want. Moreover, a small backlit LCD display is placed in the front of the machine as well. An easy-to-view LCD screen displays information regarding the stitch type, speed, and width. Easy, one-push buttons are also placed just around the screen area. This advanced and efficient machine also has a brightly lit workspace. You can switch the LED light on or off at the needle area. This allows you to stitch accurately and confidently. The Brother Laura Ashley limited edition sewing machine also comes with an extra larger workspace area. This makes the machine suitable for quilting as well. So, you can now stitch all sizes of fabric, small to large easily with the spacious work area. The built of this sewing machine is sturdy and very durable. It weighs 11.2 pounds so it will remain stable in its place while you’re working on it. This Brother sewing machine is computerized and has 135 built-in stitches. 135 built-in stitches mean an endless amount of creativity and versatility. Many higher priced products come with much fewer stitches, unlike this machine. So, you can create custom stitches and designs with this machine in minutes! In addition, it has a speed of 850 stitches per minute! The machine also comes with 8 different built-in buttonhole styles. You can easily stitch different buttons with this machine. So, how does this computerized machine save you time? It has an automatic needle threader system! And that’s not all. The machine also has a jam-resistant bobbin pin system that prevents the bobbin from getting stuck. This saves you a load of time and effort. These features of the machine will ensure that you have the most positive stitching experience. Moreover, the machine fully allows customization and personalization with its adjustable settings. These include the adjustable settings of speed, width, and length of stitch. The stitch speed can be adjusted easily with the sliding lever. This gives you full control over your stitches. The machine also has a convenient on/off button. It also has a 7 variable feed dog system. This makes the machine ideal for quilting. You can work on any fabric of any size. You can also stitch basic monograms on your fabric from a variety of built-in 55 alphanumerical monogramming stitches. You’ll be surprised to hear about the accessories and extra features this machine comes with. Considering the range of features, you can say that the machine is affordable enough. The product comes with 11 extra accessory feet. These include ¼ inch quilting foot, zipper foot, and buttonhole foot. The others are a monogramming and overcasting foot. You can use the overcasting foot to prevent your fabric from unraveling. You can even create serge-like edges with this sewing machine. Other than that, the machine comes with a few extra items as well that might come in handy. These are needles sets, bobbins, cleaning brush, and extra spool spins. Don’t know where to store the extra items? Don’t worry; the machine comes with an accessory bag that can store all your accessories safely in one place. This Brother sewing machine is focused on making the user’s experience convenient and easy. It does this by providing the buyers with an instructional DVD and an operation manual. You can use the machine to its maximum potential with the help of these guides. Singer is another famously known brand in the market. Both of the brands make competitive products. 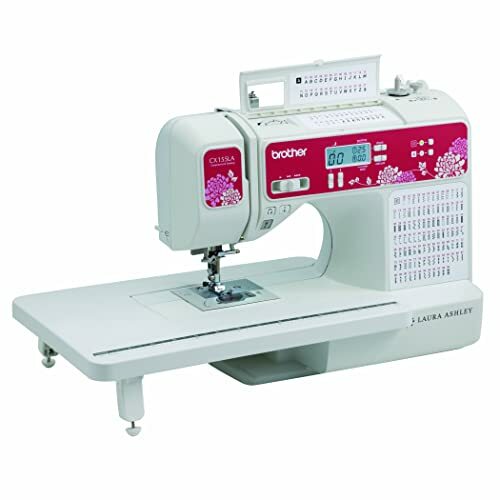 The Singer 7258 sewing machine is a competitive product in the market. Let’s see how the two products differ from one another. Both the machines are computerized, which means they will stitch much faster and better. They both have an automatic needle threader system. One thing that the high-end Singer sewing machine could not beat the Brother CX155LA in is the number of stitches. The Singer machine has about 100 stitches, but the Brother machine has 135. Moreover, the Brother sewing machine offers 8 one-step buttonhole styles, while the Singer machine only offers 6. What about the adjustable settings? Both the products have similar adjustable setting options. They both have adjustable stitch length, speed, and width. However, the Singer 7258 has better portability than the Brother CX155LA. The Singer machine comes with a hard, metal carry case. This is ideal for users that have to carry it with them to classes. Other than that, both machines have more or less very similar features. For instance, features like a brightly lit workspace, bobbin system, and speed control lever are available in both products. However, the Singer machine could not beat the quilting ability and the extra workspace of the Brother machine. The Singer 7258 is also much pricier compared to the Brother CX155LA. Large variety of 135 stitches to choose from. Personalization and freedom to stitch with adjustable settings. Range of 11 accessory presser feet. Create perfectly stitched, serge-like hems. 8 one-step buttonhole styles allow customization. Generous warranty offers of 25years. Easy speed and feed dog controls. Affordable and adds value to money. Features similar to higher end and expensive products. Comes with generous accessories including an accessory bag. Reasonable stitch speed of 85 stitches per minute. Suitable for quilting purposes. You can use it for larger fabrics as well. The colored pattern on the front may not be liked by many users. Some parts of the machine are made of plastic. Brightness of the light in the work area is not sufficient. Our top recommendation is the most trusted e-commerce seller, Amazon. You will get the best product not only at the best price, but also with some good amount of user feedback. Amazon delivers your products on time in a safe and sound condition. There are also pictures that can help you have a nice look at the machine before buying. 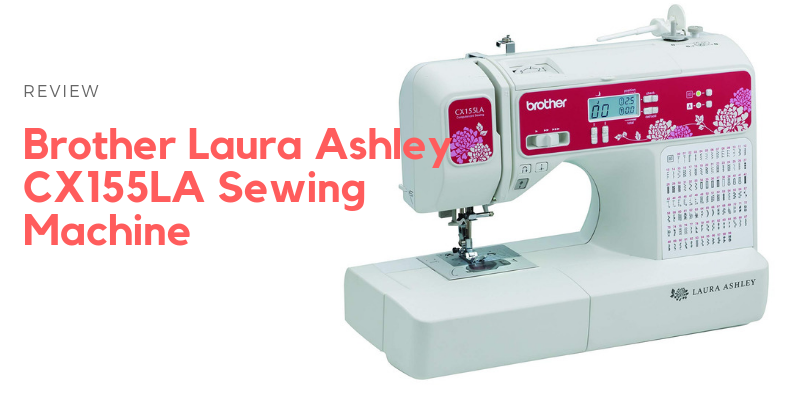 This is the best place to buy the Brother Laura Ashley CX155LA. You’ll also find the CX155LA on other online websites. Similarly, given the popularity of the CX155LA, you’ll also find them in local stores. To conclude, we can say that the Brother Laura Ashley limited edition puts great value to your money with its number of features. These features are usually present in pricier and higher end products. This machine can be all you need to add to your sewing set up. For professional or beginner use, the machine will prove to be substantial. However, your decision should be based on thorough research. If your budget allows, you can also look into the higher price range where the features and quality could be even better. So, in the end, it comes down to individual preferences, budgets, and expectations.